All transactions are safe and secure with a reliable history in online purchasing behind each of our associates. 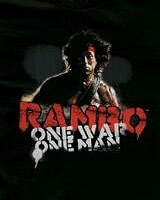 Buy the Rambo One War One Man t-shirt to own Rambo clothing and merchandise. Let everybody know that Rambo is your homeboy by wearing this One War One Man tee. Everybody should have a friend who is a Green Beret, trained in all aspects of survival, weaponry, martial arts and guerrilla warfare. Basically, he's a soldier with "great skills", and he's your friend. Wear this First Blood Rambo t-shirt the next time that you drive into a bad neighborhood. Don't forget to bring your Rambo 2 survival knife with you for some stylish protection. Throwing knives might not be a bad idea either. In addition to the Rambo One War One Man tee above, browse the Rambo Clothing Gallery for more apparel like men's and women's clothes, kids shirts or hoodies.